Thanks to you From pursuing passions with food to pitches for business capital on national television, the business community across Wellington is active and going places according to this edition of Business Leader. That reinforces our motivation for starting this business-to-business publication: providing a chance to celebrate successes among friends and offer different perspectives on how to excel as business people. Regardless of the size of business there is a shared common challenge: generating revenue and keeping expenses in check. If unable to navigate this simple formula, businesses are destined to fail, despite how hard someone works or how great their product or service is. One thing we do believe helps is businesses supporting each other. This can take many forms, from recommendations to actually purchasing goods and services locally. It’s pretty tough to expect support locally from consumers when business leaders themselves opt to buy elsewhere. Of course we all need a better understanding of what is available where. A number of years ago a local merchant was surprised by the reaction of a new customer. She was enthralled at the quantity of items and quality the local merchant offered. After a bit more discussion at the till, it turned out the customer had moved here a few years earlier but never bothered to wander downtown. It represents an unfortunate admission that many merchants do a poor job promoting their store. In order to be patronized stores have to promote - and the trick to it all, as per the earlier notation in this column about keeping expenses in check, is business owners must make wise choices about where to spend their marketing dollars. Every cent is an investment used to drive sales and awareness. 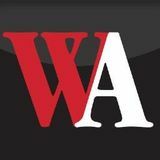 The Wellington Advertiser and its trained team of sales consultants have ideas for businesses of any size. Thousands of clients each year use the paper to promote their services or products and benefit from a consultative approach to determine what will work best for the customer. It’s pretty tough to expect support locally from consumers when business leaders themselves opt to buy elsewhere. A number of years ago the Advertiser diversified by purchasing Fergus Printing and Keltech Signs to offer a complete lineup of marketing options for customers. We also offer direct mail services. And the best part? We employ local people, pay local taxes and help keep the local economy strong. Thanks to you, it is working. the integrity and recognition that comes with the international CARSTAR brand certification. It also ensurestheir professional team receives up-todate training. The Realtor You Choose Matters. FERGUS - With her specialty roasted and locally grown nuts, Elisabeth Burrow has cracked the niche food market. Burrow started Jewels Under the Kilt in 2013 from her kitchen on the 5th Line between Fergus and Belwood. The company sells hand-roasted nuts in unique flavours like maple pear ginger pecan and maple carrot cake walnut. The fresh taste and fun flavour combinations expanded the popularity of Burrow’s nuts beyond Wellington County. 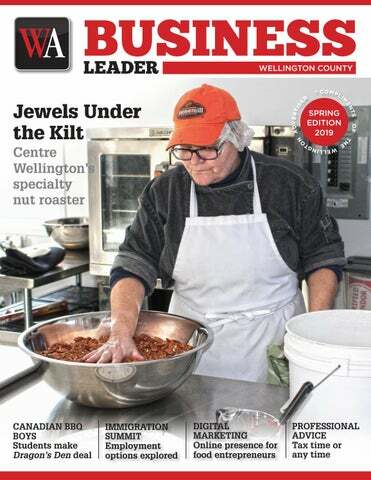 Currently Jewels Under the Kilt nuts can be found on Amazon, in some Sobeys and Your Independent Grocer stores, and in food markets across Ontario and British Columbia. In pecans alone the company roasts and sells over 6,000 pounds annually to satiate the demand for the specialty nuts. What started as a way to use up her in-laws’ maple syrup ended up providing Burrow and her husband Mitja Kosir with a growing business – one they hope to pass on to their daughter Jessie. Jewels Under the Kilt is an unconventional name for an unconventional success story (the name is a tribute to Fergus’ Scottish roots). SEEDS OF SUCCESS In 2010 Burrow had had enough of her job in health care. As a support care services compliance advisor, Burrow was in charge of fixing issues in retirement homes. In the position she faced daily struggles with food quality, pest control and building repair. When Kosir’s IT job with the government took him from Toronto to Guelph, they agreed Burrow would take a couple years off from working. She spent her time cleaning up the 95-acre property they bought outside of Fergus and getting back to her passion for food. “At the same time my husband’s family was giving us maple syrup and I don’t eat maple syrup. We don’t make pancakes, so I didn’t know what to do with it,” Burrow said. As a pescatarian, however, Burrow ate a lot of nuts as protein supplements. “I started thinking that I can use this syrup and I started working the syrup. As I was working the syrup it came off so … you didn’t taste all of that syrup but you could still taste the nut,” explained Burrow. specialty nuts he said he knew it was a great product to sell. “The product came to my attention through another party,” Seguin said. He distributes Jewels Under the Kilt nuts across eastern Ontario. “After looking into it I discovered that it was very unique, local, fresh, tasty, gluten free and made without using any preservatives or additives,” he said. According to Seguin, Burrow’s specialty nuts have been successful across eastern Ontario because they satisfy a craving for a healthy treat. “Consumers today are shopping for and buying local, healthy, all-natural foods. Jewels Under The Kilt fills those demands,” Seguin added. Burrow describes as the bitter taste in bulk bin nuts. Along with proper storage, Burrow said Jewels Under the Kilt nuts taste fresher because some of the nuts are sourced from Burrow and Kosir’s own backyard. The couple started planting fruit and nut trees the very first year they moved to their 95-acre property. Currently, Burrow said, the couple has approximately 500 trees bearing 14 different varieties of nuts – including four different types of chestnuts alone. Burrow explained growing nuts in Ontario is a relatively new phenomenon that began just 30 or 40 years ago. Before that it was generally thought Canada’s climate was too cold. “No one would really know that we grow nuts in Ontario. And it’s still asked, ‘you can grow nuts in Canada?’” Now, she said, the nut growing business in Canada is booming, due in no small part to a move by master chocolatier Ferrero Rocher. Since building its production plant in Canada in 2006, Ferrero Rocher has committed to buying more local nuts for both its chocolates and chocolate-hazelnut spread, Nutella. “It’s all a learning curve, so it’s all about education,” said Burrow of the increase in Ontario nut farms. Elisabeth Burrow, left, accepted the Premier’s Award for Agri-Food Innovation Excellence in 2015 and 2017 from Cambridge MPP Kathryn McGarry. Despite the company’s success, Jewels Under the Kilt only recently hired a fulltime employee to help Burrow and Kosir, who retired from IT in 2013, pick and package nuts. And all of the roasting is still done by hand. What are you doing to Attract & Retain Quality Employees? What do Employee Benefits look like with EFG? Financial Advisor, Manulife Securities Incorporated, Life Insurance Advisor, Ecclestone Financial Group Inc.
Financial Advisor, Manulife Securities Incorporated Life Insurance Advisor, Ecclestone Financial Group Inc.
Life Insurance, Advisor Ecclestone Financial Group Inc.
*Stocks, bonds and mutual funds are offered through Manulife Securities Incorporated. Insurance products and services are offered through Ecclestone Financial Group, Banking products are offered through referral. *Manulife Securities and the block design are registered service trade marks and trade marks of The Manufacturers Life Insurance Company and are used by it and its affilliates including Manulife Securities Incorporated. “I want to do it that way for a while because we have more control so I can find, if on the off chance ... there is a shell, we can catch it because [it’s all done by hand],” Burrow said. In November Burrow received certification to roast nuts in her own roaster on her property. No Matter What Happens... We’ll straighten it out. When it comes to collision repair, CSN Hutten’s expert staff will get you back on the road safely. You can trust CSN Hutten. some of the producers there and we weren’t really sure how it went,” Sutton said. “But we ended up getting onto the waitlist so we weren’t actually into the show.” The episode was to be filmed on a Tuesday in the spring of 2019. The Sunday before, the Canadian BBQ Boys received a call that there was a cancellation and Dragon’s Den wanted them to fill in. That Monday, the business was set to start up for the summer season. it. We opened three stores back here (in Ontario); I closed all three after five years, went back home; we weren’t ready. “If you start spreading too soon, too quickly, you’ll lose what you have here.” It’s this willingness to learn that make McCoy and Sutton such great entrepreneurs. business,” Sutton said. “You never know where you can take it and at the very least it’s great experience and it will lay the foundations for you as an entrepreneur or in the business world for your future. “So I really want to push students to just get out and start doing services in their local neighbourhoods, scale it throughout their communities and really see what they can do in building a brand and you can just learn so much.” McCoy said technology and the internet can be a distraction for students who think they need to start a marketing agency or drop-ship products. “In reality you get the core fundamental business experience when you’re actually out doing,” he said. “And we think starting a service business, starting door-to-door is a fantastic way to start. “You network, you meet new people, we learn advice from our customers every time.” He added, “We don’t see it as competition even if you want to start a barbecue cleaning business, we just want to see students start service businesses and we really want to move that forward.” The Canadian BBQ Boys will be out in full force this summer and McCoy and Sutton plan to continue with the business once they graduate from their fifth year of university. The main message they want to share is that every barbecue needs to be cleaned. “Our biggest goal is to spread awareness about the fact that you need to keep your barbecue clean and once enough people understand the importance of it we feel like it would be a great benefit,” McCoy said. For more information visit https:// canadianbbqboys.com. Menopause & My Weight Loss Journey The Weight Loss Journey can often be one that feels impossible and frustrating. As we age and start to struggle with hormone imbalance this battle becomes even harder to win. We work out, eat healthy and yet our weight and body fat won’t budge. Most research shows that hormonal shifts, perimenopause and menopause can be yet another reason for lack of success even with great efforts. My journey began in early 2012. At that time, I was going through some personal changes and needed to lose some weight. My true needs were as follows: severe hip pain, low self-esteem and feeling generally unhappy with my body shape. I started the weight loss program with no expectations and was overwhelmed with the results. Within two weeks my hip pain disappeared, my energy soared and I was on the road to success. In 2 months, I lost over 30 lbs and 6 years later have not re-gained. I truly believe in the success of our Homeopathic Weight Loss Program which burns stubborn fat in unwanted places and re-sets the metabolism. Over the years we have made modifications to enhance the clients’ success. For example, In September 2017 we began to incorporate the Saliva Hormone Test for women in perimenopause and menopause recognizing the connection between weight gain & hormone imbalance. This is a great tool for women struggling not only with weight gain, other symptoms as well such as anxiety, depression, hot flashes, irritability, mood swings, low libido, night sweats, and sleep issues. (insomnia). Testing provides us with the opportunity to balance hormones & provide the client with a tailor-made program of natural pharmaceutical grade supplements. Drug free, side effect free! Our vision is to assist our clients in establishing long term Success Habits and Consistent Lifestyle Changes (never to referring to our program as a Diet!) After reaching their Weight Loss Goal, we will continue to monitor their success and hold them accountable for maintenance through our Membership Program- Phase #2 with Amanda, our Nutritionist & Lifestyle Coach. Many Women struggle with weight gain during Menopause which can not only affect their physical health but also their emotional health with low self-esteem and poor self image. There are times when our greatest success comes from working with a different approach and a positive accountability partner. At our age its all about putting ourselves first and staying healthy for our families. Contemporary Canadian Wellington County Warden Kelly Linton addressed the crowd at an Immigration Summit hosted by Wellington County at the Elora Mill on Feb. 20. 519.635.8222 hand through it.” Lusis pointed out newcomers don’t just fill jobs, they also create them. New ‘Thrive in the Workplace’ wellness app launched by Career Education Council that resulted, currently gives free training through workplace wellness workshops to workplaces and schools in Southern Ontario. Since the launch of the app, the CEC has been able to provide the same training to a broader scope through the Thrive in the Workplace app. The app’s launch was a celebrated success for the CEC after a year of app development. The financial advice world is always changing and it’s time to ask yourself ... Does my advisor ask me enough questions to provide me with the best integrated advice for me, my family and my business? Is my advisor keeping up with the ongoing changes to income taxes and government grant opportunities when recommendations are provided? WHAT DO SHOPKEEPERS DO TO ENCOURAGE CUSTOMERS TO ENTER THEIR STORE DURING COLD WEATHER? Many shopkeepers run special promotions and other incentives to encourage customers into their stores. Often this is also a popular time to have a first chance at new products for the new year, and this is always exciting for customers. Most shopkeepers also work hard to keep their business looking as great as possible, combatting the snow, ice and dreary days with vibrant displays and a welcoming environment. DOES THE BIA HAVE ANYTHING PLANNED TO BRING PEOPLE TO THE DOWNTOWN CORE THIS SPRING? The spring event was the “Upside Down” sale, which is held in celebration of St. Patrick’s Day weekend (March 16 to 17 this year). Merchants on our Main Street dusted off their shelves, emptied stockrooms, cleared out basements and slashed prices as never before. Village merchants showed their Irish pride with decorations and tastes of Ireland. HOW CAN A NEW OWNER CHANGE THE ATMOSPHERE/VIBE OF A PRE-EXISTING STORE? Being a small downtown area we have not seen huge changeovers in the ownership of existing shops. However, we have had a few new owners, and this has typically brought a new dynamic. New owners often want to put a new twist on the business they have purchased, and this creates interest for customers and other businesses alike. New owners also frequently bring a new energy with them, and may be interested in getting more involved with special events or other activities. HOW ARE YOU WORKING WITH YOUR LOCAL TOURISM ORGANIZATIONS TO BRING NEW CUSTOMERS TO TOWN? We are participating in a “Community Tourism Plan” process in conjunction with other local stakeholders and Central Counties Tourism. This is partially completed at this stage, but we hope it will bring new collaborative opportunities. Our BIA also regularly contributes content to Headwaters Tourism and other tourism agencies. Get into a BL home of your own with $1,000* for your first mortgage! Does my advisor consider the connection between my family and business financial goals when providing investment, retirement and estate planning advice? If you’re having doubts, you may be missing out on good financial advice. We’d like to help! Feel free to contact us for your free second opinion! 181 St. Andrew Street East, Unit #8, FERGUS Manulife Securities Incorporated is a Member of the Canadian Investor Protection Fund. Culinary Excellence From a simple continental breakfast to a formal dinner, our hospitality and banquet staff take immense pride in providing you and your attendees with a creative and exceptional dining experience. Our team will work with you to tailor a menu solution that will impress, while adhering to your budget. At the Guelph Golf and Conference Centre we believe that you deserve a Great partner during the intricate process of crafting a meeting or event From planning to closing remarks, you’II feel confident knowing that you are supported by an entire team of meeting professionals fully vested in your success. Book your next event with us. 116 Main Street North, Mount Forest 519.509.6728 | www.kindredcu.com * Applies to five year fixed-term residential mortgages for first-time homebuyers (owner-occupied). ADVERTISE YOUR BUSINESS WHEREVER YOU GO! ABOYNE - Wellington County food entrepreneurs should clean up their online presence with some “digital hygiene work”, according to an advisor who led a recent digital marketing and social media session at the county museum. Digital disruptor Charlotte Moore urged farmers and food sellers to adjust key details of their internet image, to simplify and enhance interactions with potential customers. “Many people get overwhelmed quickly when we talk about digital,” said Moore, digital project manager for RT04, the provincial government’s tourism agency for the territory that includes Wellington. She previously worked in digital development for Guelph Tourism Services. The communication and marketing landscape has changed significantly over the last few years and businesses are looking to hone their digital marketing skills. “A lot of digital is actually just hygiene work, and I don’t mean going home and taking a digital shower,” she said. “I mean fixing your digital asset and presence so that you can go on to have very successful digital marketing. The marketing is kind of the easiest part.” The event at the Wellington County Museum and Archives was co-hosted by Foodlink Waterloo Region, a non-profit group that promotes local food and connects farm and food businesses; by LaunchIt, which helps new businesses with mentorship, workshops and support programs; and by Taste Real, an initiative of the Wellington County economic development office that facilitates local food connections. The @lmhallman Instagram site was cited as a good example of attractive, simple design, with convenience links for visitors. when they look at your content? How can you convey that from your physical brand to your digital brand?” said Moore. “There’s a lot of content online, and how can you cut through the noise? By being authentic and sharing your story.” She showed some examples of effective online presence, including the Instagram feed of Lauren Hallman (@lmhallman), a food photographer and vegan baker based in Elora. The photos are consistently dramatic and bright, with clean white backgrounds, and convenient links to commentary, a blog with recipes and a website (veganfoodwithgratitude.com) that promotes other services such as video production. “She has a beautiful online brand,” said Moore. “This is a really good example of how you can be consistent across all of your platforms.” She also highlighted the online marketing of Strom’s Farm and Bakery on Wellington Road 32 just south of Guelph. Their site (strom.ca) not only has a guide to their various events, photos of food products, a link to a Twitter feed and advice how to plan a visit, but there are many informal photos of people having fun – especially kids and dogs. The Strom’s Farm and Bakery website was cited as a good example of online marketing through photos of products, how to plan a visit and informal photos of people having fun. “This is how you can be authentic through your mobile content,” said Moore, noting farm owners can snap mobile phone photos of visitors. “Everyone loves dogs and everyone loves babies.” She said farmers should still engage their customers in the off-season with posts about their preparation and plans for the next season. Moore was also impressed with the online marketing of Bliss Dough (blissdough.com and @blissdough), which sells vegan cookie dough made to be eaten raw, not baked. They offer free delivery in Guelph. Some of their online photos are product selfies – photos with a jar of their dough held in the foreground, and the store where it is sold in the background. CAR & TRUCK RENTALS A Full Line Of Commercial Trucks and Passenger Vehicles. BLISS DOUGH WEBSITE AND INSTAGRAM ARE FULL OF PRODUCT IMAGES. Through LaunchIt Minto, a partnership between Wellington County, the Town of Minto and the Minto Chamber of Commerce, we offer access to professionals that assist businesses. We do this by hosting monthly workshops on a variety of topics including business finance, human resource-related topics and much more. LaunchIt is proud to say that we have eight mentors from the community that have many years of specialized experience ranging from business banking and finance, construction, human resources, marketing and communication as well as very successful long-term business owners. Another tool LaunchIt offers to businesses seeking assistance is our “Ask an Advisor Thursdays.” For more details visit www.launchitminto.com. The Minto Chamber of Commerce is here to help, support and grow businesses in Minto. We are a strong voice with our municipal government and the Ontario Chamber, Canadian Chamber and CFIB all are there to advocate for small businesses with the provincial government. If you have questions, talk to your MPP’s office. They have a lot of knowledge and are willing to assist. The chamber works with the Ontario Chamber of Commerce (OCC) quite closely and they are preparing reports to present to government officials. Many of these are based on surveys the OCC sends out to local chambers to send to our members as a way to influence and let government know the pulse of the business community. Not directly, however we hosted an education session on March 20. We had a Canada Revenue Agency representative come to answer questions from small business owners. We are encouraged by the lowered corporate tax rates, and increased depreciation rates for new capital investments. However, as each individual and business have their own unique set of circumstances and fact patterns, we advise that members seek out professional tax advice from their accountant. Business owners interacting with the new provincial government should first build a relationship with their local MPP to help advocate. If there is an issue effecting their industry, bring a collective voice to the table, along with your local chamber of commerce. **If you have a question you would like to pose to local chambers of commerce and/or BIAs, email your suggestion to businessleader@wellingtonadvertiser.com. Spring is always an exciting time for business after a long hard winter season. Our members look forward to travellers returning to our beautiful area, more people out and about enjoying the long-awaited spring weather and no downtown construction projects this year. The Minto Chamber is hosting the 10th Annual Community Achievement Awards dinner on April 25 at the Harriston Legion. We encourage the public to submit nominations and show how much they appreciate our local businesses, organizations and people doing great things in our community. For a list of awards, nomination form and to purchase tickets visit: mintochamber.on.ca/programs. Optimistic! It’s always better to see things in a positive light. A crystal ball would have been a wonderful tool for this job! Spring outlook is positive as new construction looks to continue successive high years of building permits. The number of 2018 residential construction permits were up 25% over prior year. The number of agriculture/commercial construction permits remain steady, with 2018 permit values 45 to 57% higher than the two previous years. Succession planning is one area of business that is often overlooked, but is likely one of the most important aspects of a successful business plan. The Minto Chamber is happy to support and promote a regional collaboration with the Saugeen Economic Development Corporation and five municipalities - Brockton, Hanover, Minto, Wellington North and West Grey - called “Saugeen Connects” which is an online succession matching platform. The mission is to collaborate and positively impact area economic growth, support youth retention and development as well as support growth and retention of businesses. This online community of business buyers, sellers and succession planning professionals is an excellent tool connecting farm and business buyers and sellers. After a profile has been created users have access to matching services, full library of resources and business listing options. An economic development officer also reviews each new member profile and sends out a welcome message with suggestions for next steps in their transition plan. Members control their own profile and set privacy options to allow secure and discreet site access. As a business owner, you need to know what your exit plan for your business is, whether it’s sooner or later. That way you are in control of your future. A number of our members have the talent and tools to help our members find the help they need. We have held education sessions in the past years on this topic and will again in the future as the need arises. Succession plans help owners plan for retirement, and ensure that the highest possible value is obtained. With succession plans in place, we will often see a business change hands and continue to operate, and remain an active part of our community. We support the Saugeen Connects initiative by Wellington North Township with neighbouring municipalities, where resources are geared directly to succession planning, connecting those wanting to own a new business with those selling their business. BUSINESS CHALLENGES IN ERIN COMMUNITY MEETING In January Jennifer Kindred-Bulbulia held a community meeting to talk about doing business in Erin. She and her husband run the BK Foundation, an animal therapy facility. She said the foundation has run into repeated roadblocks with the town and supporters. Kindred-Bulbulia hoped to gather a sample of the challenges and successes for business owners in Erin in order to make a presentation to the town. ONTARIO GETS HIGHEST GRADE EVER IN RED TAPE REDUCTION EFFORTS Ontario recently received an A-, the province’s highest grade ever, in an annual report card that evaluates governments across Canada on their progress in cutting red tape for business. This is an increase from the C+ the previous government received in 2018, Ontario’s second-lowest grade ever. L&M FOOD MARKET The L&M Food Market in Elora was closed by the public health unit in December. The Elora community is looking at opening a co-op grocery store to fill the void. CANNABIS RETAIL STORES The votes are in and the majority of Wellington County municipalities are open to business for cannabis retailers Municipalities allowing pot stores include: Minto, Wellington North, Puslinch and Guelph-Eramosa. Those that have opted out are: Centre Wellington, Erin and Mapleton. anniversary this year. On July 13 all four branches will be holding a barbecue from 11am to 2pm as well as offering sales and specials. LLOYD SCOTT ENTERPRISES LTD. Lloyd Scott Enterprises Ltd. in Alma is celebrating its 50th anniversary this year. The business helps clients with home renovation projects, from aluminum siding, new windows and doors, to custom kitchen cabinetry. Located at 46 Peel St. in Alma, Lloyd Scott Enterprises Ltd. is rooted in Wellington County. To contact the business visit lloydscottenterprises.com or call 519-8465871. ASKETT’S APPLIANCES CENTRE Askett’s Appliance Centre is celebrating 50 years in business. The business is located at 222 Main Street West in Palmerston. Customers can stop by or call 519-3433512 to congratulate owner Keith Askett. CREEKBANK SEWING MACHINE SHOP Creekbank Sewing Machine Shop is celebrating its 10th anniversary. The business is owned by Vernon and Minerva Knorr and is located at 084696 Southgate Road 8 in Mount Forest. The business offers full service and repair on all makes of sewing machines, specializing in Bernina Dress fabrics, workshops, etc. For more information call 519-323-2693. EDEE’S PLACE Edee’s Place in Listowel is celebrating its 25 anniversary. Located at 1180 Wallace Ave. N., the supply store serves dancers, gymnasts, skaters and hockey players with new and used equipment. For more information call 519-291-5164. The business is open Monday to Saturday or by appointment. JESTER’S FUN FACTORY Jester’s Fun Factory in Fergus once again facilitated the creation of the world’s largest mass-produced jigsaw puzzle. This time the puzzle, called “Around the World,” is 24 feet long and contains 42,000 pieces. Working on the puzzle earlier this year, from left, are: Sharon Brioux of Orton, Jennifer and Michelle Coyle of Kitchener, and Kim Walker of Fergus. The Three Biggest Problems You’ll Have With Most IT Support Companies, And How PlanetCPU Overcomes Them All If you are a highly successful, results-oriented business owner trying to focus your energy on growing your business, but you find yourself constantly distracted and frustrated with computer problems, read on. Our names are Mark Reed and Terry Godreau, CEO’s of PlanetCPU. We specialize in making IT “invisible” to our clients – you simply tell us what you are trying to accomplish in your business and we make it happen without excuses, problems or complexity. The Three Biggest Complaints Business Owners Have About Most IT Firms Problem #1: You Have Constant Technical Problems. Problem #2: They Nickel And Dime You To Death. Maybe you’ve experienced this yourself; you hire a so-called computer expert to support your network, only to discover every time they “solve” a problem, two more crop up. Or the problem they were supposed to have solved keeps coming back again and again. Then, to add insult to injury, they don’t check their work, they keep charging you to come back and repair the same issues, or they waste your time trying to explain why the problem is happening instead of just taking care of it. Most IT consulting firms make the majority of their money selling you an expensive, complex computer network plus a hefty monthly maintenance fee to keep it all up and running. Then, every time you need some little thing done, you get another bill. Some days it can feel as though every time you turn around you’re writing another check for some service, new hardware or software upgrade. Even then, you don’t get the support, service or RESULTS you want – and you STILL end up having to deal with IT problems and limitations. From arrogant technicians who talk over your head to zero communication on the status of your requests and projects, another BIG problem many business owners have with their IT person is poor communication skills. On top of that, NONE of them seem to understand basic business concepts and want to have a conversation about the technical details rather than the results you’re trying to achieve. There is a better way. We can show you how to eliminate expensive IT Support fees and implement a “pay as you go” service for IT, just like a utility. & more OPENINGS ID COMPUTER SERVICES ID Computer Services is a new business in Palmerston that repairs, refurbishes, upgrades and sells new technology. The business, located at 125 Main Street, held a ribbon cutting ceremony on Jan. 22. ELORA MERCANTILE The Elora Mercantile is now open. The purveyor of fine goods and services is located on Church Street, behind Drimmies Florist, across the street from Hanscomb Glass Studio. For more information visit Elora Marcantile on Facebook. Home-based businesses make up a big part of the Centre Wellington business community. The Centre Wellington Chamber of Commerce recently held a reception and ribbon cutting ceremony to welcome new businesses. From left: Alex and Kathy Maggs of C.K. Maggs Adventures in Fergus, Centre Wellington councillor Neil Dunsmore, Wellington Advertiser sales manager and chamber representative Jim Alexander, Steve and Patty Haney of Whiskey Jack Painters in Alma, chamber representative Sheri Copplestone, township councillors Ian MacRae and Kirk McElwain and chamber representative Paul Walker. PEPPRELL DISTILLING CO. Pepprell Distilling Co. is opening its own manufacturing facility in Mapleton in July. The distillery specializes in Pepprell Gin, which is made by hand in Vaughn by Last Straw Distillery Corp. SOUTHERN CRISPY CHICKEN Southern Crispy Chicken has opened at 514 Main Street in Mount Forest. The restaurant, which has taken over the former Mount Forest chamber building, offers a variety of different chicken meal options. For more information visit southerncrispy.com. For takeout call 519-509-6000. NORTHERN LIGHTS POOL AND SPA Northern Lights Pool and Spa is located at 258 Main Street South in Mount Forest. The business, owned by Paul and Rachel Hiempel, offers outdoor living products and services. For more information call 519-5092809.
the 2019 IP (identity preserved) soybean crop in Palmerston. Call 519-528-2092 for more information. NORTH WELLINGTON ANIMAL HOSPITAL Dr. Ashish Prajapati has taken over the North Wellington Animal Hospital at 248 Main Street South in Mount Forest. Prajapati has been a veterinarian since 1989. Services, available Monday to Friday and on Saturday by appointment, include small animal emergency care, hospitalization, dental cleaning, radiograph and more. For more information call 519-323-2060. I’M SOOOO BAD! Lori and Wayne Billings have taken over “adult” store I’m Soooo Bad! in Mount Forest. The business, located at 110 Main St. North, is open Tuesday to Saturday and closed on Sundays and Mondays. For more information or questions call 519-323-9969. PARKER MEATS CUSTOM BUTCHERING OF FRESH AND FROZEN MEATS Nick Martin has taken over Parker Meats Custom Butchering of Fresh and Frozen Meats. The business is located at 7465 Wellington Road 12. For more information call 519-638-0016. The store is open from 8am to 6pm from Monday to Friday and 9am to 3pm on Saturday. RELOCATIONS DUFFERIN MUTUAL INSURANCE Dufferin Mutual Insurance Company in Mount Forest has recently relocated to 258 Main Street South. For more information contact Sandy or Michelle at 519-323-1420. RETIREMENT Centre Wellington television personality Larry Peters, Cogeco TV manager, has retired. After moving to Fergus in 1980, Peters started with Cogeco in 1994 after volunteering for two years. When asked if things are easier in the cable television business now, Peters said, “When computers are working right it is a lot easier, but when a computer breaks down it becomes very hard. These days the quality is much better and the tools for editing are amazing to work with.” Peters’ plans for the future are up in the air for the moment, but he plans on taking some time off to relax. Baker Tilly, formerly Collins Barrow, held an open house grand opening in Guelph on March 7. The chartered professional accounting firm moved to its new space at 450 Speedvale Ave. West to help support business growth. The new space opened at the end of January and can accommodate about 30 staff, double what the previous location in Guelph could handle. At the grand opening managing partner Todd Campbell thanked BJC Architects Inc. and Nith Valley Construction Ltd. for their work on the renovations. Cutting the ribbon, from left, were partner Ted Smith, partner Sara Detweiler, partner Garreth Madden, Guelph Mayor Cam Guthrie, partner Todd Campbell and partner Luc Joye. The Fergus Small Business Centre had its grand opening last summer. From left: Centre Wellington economic development officer Patricia Rutter, Centre Wellington Mayor Kelly Linton, Guelph-Wellington Business Centre executive director Kristel Manes and business advisor Corina Sipkes. closed businesses – they’re very clear on what that takes.” The centre also offers an “ask the professional” series, using partners in the business community. For a minimal administration fee, clients can book an online session with an accountant or a lawyer who is volunteering their time. they are taxed – they want to understand how business income is taxed, what sort of deductions they can claim, especially when there is business use of personal assets, how to keep track of their expenses,” said Detweiler. “Sometimes they require cash flow forecasting to present to the bank.” The advice is particularly helpful for small businesses that do not normally have an accountant working on their behalf. “We get people that maybe have been in business for a while, operating as a sole proprietor, and want to know if they should incorporate – what are the benefits of incorporation, how would they be taxed and how would they get their money out?,” she said. “It depends on the situation. Sometimes it may be for legal reasons that they should, to protect their personal assets, but it might not make sense from a tax perspective. They always have to look at the legal issues as well.” Mary Ng, federal minister of small business and export promotion, has been touring Canada promoting government initiatives to assist entrepreneurs. On Oct. 16, 2017, the federal government announced it would lower the small business tax rate from 10.5% to 9%, as promised during the election. It reaffirmed this reduction in the 2018 budget. The rate dropped to 10% as of Jan. 1, 2018, and to 9% on Jan. 1, 2019. This applies only to active business income under $500,000. borders,” said Detweiler. “Fortunately our firm is part of an international network, so we can reach out. “I just had a client looking at a business investment in Costa Rica. We were able to hook them up with somebody there. We can speak to the Canadian tax implications, but not always to the tax rules in another country.” Another recent tax change is the ability for a business to immediately write off the full cost of machinery used for the manufacturing and processing of goods, and the full cost of specified clean energy equipment. Previously the costs would have been amortized over several years. Detweiler said this is a “dramatic change” and machinery manufacturers are using it as a marketing tool. She said the government is trying to boost investment in equipment. Another change is the introduction of the Accelerated Investment Incentive, allowing businesses of all sizes, in all sectors of the economy, to write off a larger share of the cost of newly-acquired assets in the year the investment is made. Grow your business I’m here to help you find the right insurance and financial services to benefit your business now and in the future. Bringing QuickBooks Desktop to the Cloud. + Balances Cheque presentations, draw winners and donations around the county. An Erin resident won one of 25 prizes in a national contest to promote a rewards program partnership between RBC and Petro-Canada. From left, RBC branch manager David Grimason presented a $2,850 Petro-Canada gift card to client Diana Humberstone, along with RBC community manager Anastasia Bonk. The prizes were based on 40 litres of gasoline per week for 52 weeks, at last June’s price of $1.37 per litre. John F. Smith Insurance Brokers in Arthur donated $1,000 to the Arthur Lions Club for its Christmas Hamper project on Dec. 12. From left: Holly Rogozynski, Tom Smith and Barb Watts from John F. Smith present the cheque to Arthur Lions treasurer Ralph Roelofsen. Tim Hortons in Erin is thanking the community for its support during recent renovations. Owners, Josh, left, and Faith Burhoe, right, along with assistant manager Des Satuito, centre right, presented a $3,000 donation to Tammy McGugan, finance director for East Wellington Community Services. Shoetopia in Fergus recently re-opened after a week-long renovations. The grand re-opening took place on Feb. 15 with drinks and treats throughout the weekend and shoe, boot, sandal and grab bag giveaways. Owners Tammy and Peter Mohr have also taken things a little further. They’ve launched their Donation Location program. For years the store has been dropping off footwear to the Centre Wellington Food Bank, however, with the launch of this program the owners are hoping to help not only those who receive the shoes but also customers who have “gently used” shoes that are looking for a new home. When customers drop off their item they will receive a gift certificate towards a future purchase at the store. On the re-opening weekend Shoetopia collected 120 pairs of shoes for the Centre Wellington Food Bank. A box will now be left out permanently for future donations. Do you support a local charity? Send your cheque presentation photos to businessleader@wellingtonadvertiser.com to include in the next edition of Business Leader. Canarm AgSystems contributed $1,125 to the Palmerston and District Hospital Foundation’s campaign to raise funds for digital x-ray equipment during the 17th annual CKNX Health Care Heroes Radiothon. Foundation development officer Dale Franklin, left, accepted a cheque from Canarm production manager Kevin Loos. President of the Fergus Women’s Co-op, Cheryl McKenna, and co-op secretary Zena Attwood, presented at cheque for $2,000 to development and communications officer Sarah Sheehan for the Groves Hospital Foundation in December. The donation from the co-op will help pay for a gynecology stretcher for the hospital’s emergency department. AO Smith’s Women’s Resource Network donated to the Children’s Foundation of Guelph and Wellington Food and Friends Program and presented the cheque to program manager Bobbi Turner, third from left. A.O Smith donated $941. The program currently feeds over 17,000 students a healthy breakfast, morning meal, snack or lunch through 106 student nutrition programs. Every school in Centre Wellington now has a Food and Friends Program. A.O. Smith’s Women’s Resources Network hosted two events where employees contributed a minimum of $5 to enjoy a morning coffee, fruit and breakfast sandwich along with a silent auction with all proceeds donated to the Food and Friends Program. Thanks to the Union Gas community improvement grant, Veteran’s Park in Salem is now home to a new bench for the community to enjoy. “This is great news for Centre Wellington and our commitment to urban forestry” said Mayor Kelly Linton. “Thank you to Union Gas for their continuous support.” Kevin Schimus of Union Gas said “at Union Gas, we believe a community belongs to everyone who lives there. To that end, all of us want to make life better for our families, our friends, and our neighbours.” Last fall, Union Gas also provided an additional $1,000 contribution to a greener Centre Wellington at the Cotton Tail Road Trail Community plant. The funds were used for native trees and shrubs. In addition, 10 volunteers from Union Gas took part in the fall planting. If your business uses email to reach potential and existing customers, chances are you’ll ﬁnd them on Facebook too. Custom audiences allow you to upload your email list and Facebook will then match your customer email addresses with Facebook account email addresses. In this article, I’m going to share a couple steps on how you can use Facebook to grow and monetize your email subscriber list. for signing up? If you focus on B2B relationships, why not offer something informative such as an easily digestible guide pertaining to your industry? I won’t dive into too many examples as there are just that, too many examples. The goal here is to attract a cold audience and turn them into warm prospects. Run your offer ad or information ad on Facebook and start growing your new email subscriber list. Capture their email address by linking through to a landing page on your website or by using Facebook’s opt-in forms. Advanced note: Have experience with targeting on Facebook? Create multiple offers and organize your email list by interest and age groups so you can then retarget each of these groups with the right ad. targeting you’ll see your sales increase from your email subscribers. Go a step further with ‘look-alike audiences’ This is a neat feature Facebook added that I believe is still under utilized. Wouldn’t it be great if you could use your existing subscriber list to ﬁnd others who share the same interests? You can with Facebook’s lookalike audience option. Simply upload your customer ﬁles and Facebook will magically ﬁnd people who are similar to those already in your system. Have no idea what I’m talking about? Interested but not sure how to get started? Let’s chat. Save $50 on your next purchase. Visit in store. Valid until April 30, 2019. Complete Audit, Accounting, Tax and Advisory Solutions including Succession and Estate Planning.